When a pit bull attacked 4-year-old John Heineman, a hero quickly came to the boy’s rescue. Frankee the Rottweiler, was being walked by the boy’s brother, Cody Taylor. As the pit bull latched onto the boy’s arm and dragged him to the ground, Taylor screamed, “Get him!” and Frankee lunged at the pit bull, biting it in the ribs. With Frankee launching a canine counterattack and Taylor punching and kicking it, the pit bull relinquished its grip on the boy. Taylor then called 911. Taylor and Frankee live across town and just happened to be there at the time. John received what police described as “serious injuries” in the attack, one of two unrelated pit bull attacks that occurred in the city on Thursday. In the Temple Place attack, it appears the boy was reaching for a toy that was close to the animal, police said. The pit bull was on a leash at the time, but the owner couldn’t prevent the attack or pry the dog’s jaws open as it clamped around the boy’s arm, Taylor said. That dog was taken into custody and is being housed at the Humane Society for Greater Nashua, police said. Police were uncertain whether charges would be filed. John is in the pediatrics unit at Southern New Hampshire Medical Center, recovering from surgery to repair extensive tissue damage to his arm, said the boy’s mother, Becky Healey. 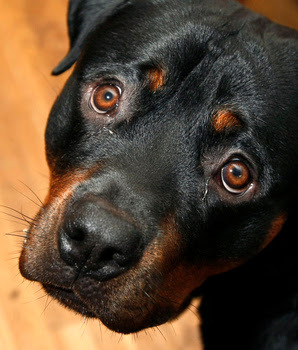 Meanwhile, Frankee is being hailed as a hero, with neighbors bringing steaks and smothering him with praise and attention as news of the 11-month-old Rott’s heroic actions are spread via Facebook postings, said Debra Mitkus, Taylor’s legal guardian and Frankee’s proud owner. John lost a lot of flesh in the attack, Taylor said. “My little brother is a tough little kid,” he said. At home, Frankee, a pedigreed Rottweiler, acts like a big lapdog who gets bullied by the family cat. He’s well-trained and readily follows hand signals to sit and lie down. But he has shown a protective instinct, never biting anyone, but positioning himself in front of kids if he feels roughhousing is getting a bit too rowdy, Mitkus said. “I just love this dog to pieces,” Mitkus said. Frankee – whose pedigree name is Franke E. Stein Von Birken Wald – is the third Rottweiler that Mitkus has owned. The ashes of her beloved first one, Baron, are kept in the kitchen. “They say Rottys are so bad, but I’ve talked to people who wouldn’t own anything else,” Mitkus said.